Discussion in 'Blog Archive' started by adiggs, Jun 28, 2013. On my trip to Blaine, WA for the start of BC2BC, I am pausing for a moment (while the Roadster is charging, and an excellent Burgerville lunch is settling) to reflect on how I find myself here. I first started driving an electric car in March of this year, so I’m still pretty new at this. If I turned around right now and drove home, then I would match the longest previous electric trip that I’ve made. Instead, I am now about 100 miles into what I estimate will be 3500 electric miles over the next few weeks. I’ve been following Tesla (primarily) and electric vehicles in general from afar for a few years. I think it was the video of the launch of Model S where the first few owners got their keys that really hooked me – that was about a year ago. Those people had enough faith in the company and the willingness to put down a deposit on an idea; and then wait 2+ years for the car. Wow. And it worked. In August / September of last year I realize two things. The first was a financial one – yes I could drive one of these cars. The second realization was that there are all sorts of problems I would like to be able to fix in the world, but mostly they’re too big for me to fix or even do much about. But here was something I see going awry, and even if I couldn’t fix it myself, I stop contributing to the problem. I could drive electric, and I could put up enough solar panels to offset the energy I consume in personal transportation. It’s the lowest rung of energy independence as I see it, but I could do that. It’s not like I was a major contributor before – the car we replaced with the Roadster gets about 35 MPG, and as much as I drive, it only sees a gas station every 3 weeks or so. Still, I could stop even that. In February of this year, our solar panels got switched on (who puts up a solar panel system in the winter in Oregon anyway?). In March, a 6 month hunt for a Roadster ended when #969 showed up in the mail (figuratively speaking – it was shipped from New Jersey). 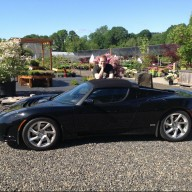 As with others, I’ve wanted to drive electric for a variety of reasons. I like the idea of being free of the oil and gas industry, at least for my personal transportation, because I want to stop transferring my wealth to the oil and gas industry. I believe that in this small way, I will contribute to the security of our country. I also believe that our national economy is better off relying on local energy sources. These contribute to my thinking, but my primary reason is that I want to stop contributing to pollution and CO2 emissions. People have commented that electric cars and solar panels go together well, and I agree. Ask me which is most important, and I would say the environment is for me. But attempting to separate them into “important” and “doesn’t matter” isn’t possible, at least for me. Someday I’ll be looking to extend my personal energy independence. I would love to have a home that generates and stores its own energy – enough for the modern conveniences, and enough to keep the car charged. That’ll be for another day. I can’t do everything, all at once, but I can do something. But why drive border to border, and back? Why participate in BC2BC - especially with so little experience at EV road tripping? Many reasons – I anticipate having an excellent vacation. My family took annual road trips when I was growing up, and that has largely disappeared from my life. I don’t know that this will be an excellent trip, but I have high hopes. I would like to bring back the road trip as a form of vacation. In addition, I don’t really experience range anxiety in the Roadster (181 miles of range when I leave the garage each morning), but after this trip, I’ll know that my world isn’t constrained by driving an EV. It might take me a bit longer to get there though, but that’s just a good excuse to slow down, and blog from the road. On this trip, besides the events and experiences surrounding BC2BC itself, I am looking forward to cruising the ocean front highway for as much of the California and Oregon coast as is practical. That will be most of it. I’m looking forward to driving the Avenue of the Giants (and if I can get it working, make a video of that part of the trip – I’m told that driving that road in a car with little or no engine noise is magic). I’ll get to meet other Tesla and EV enthusiasts throughout the next few weeks, and that’ll be another good reason to be doing this. The real reason is simple though - when you're looking for an excuse to do something (drive the Roadster in my case), then most anything will do. More to come as I wander up and down the coast! And pictures - definitely need some pictures. The BC2BC-2013 All Electric Vehicle Rally began with all vehicles departing from the Canadian border at the Peace Arch State Park, Saturday, June 29, 2013 with 1508 miles driven to Mexico.